We, as SDSU alumni, should absolutely reject the Measure G option that bears our university’s name on this November ballot. At face value, this seems like a very difficult ask. Measure G is named SDSU West, after all, and SDSU alumni tend to automatically assume that anything with our alma mater’s name must be something positive. However, the skills and analytical abilities I gained while a student at San Diego State University are exactly the tools that I used to determine that Measure G is a terrible plan for the university, its students, and the local, taxpaying alumni. Is Measure G actually good for SDSU? 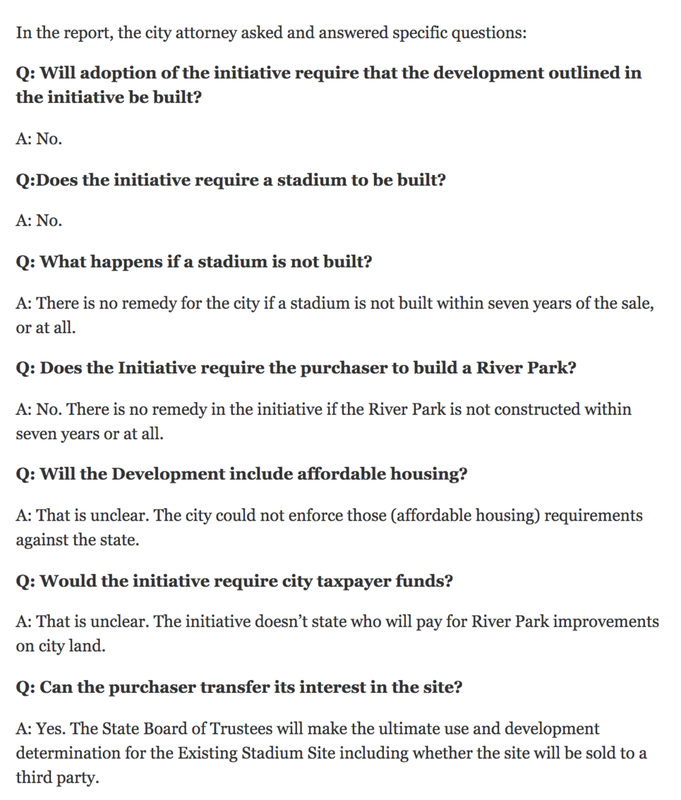 The plan stumbles immediately on the main issue for the site: the stadium itself. Measure G asks SDSU to pay $250 million out of their pocket to build the stadium. That’s almost as much as the University’s entire endowment, all for 6 or 7 football games a year. That’s an incredible amount of money. In contrast, Measure E saves SDSU $150 million on the construction of the stadium right out of the gate AND splits maintenance costs 50/50. That’s a massive initial and ongoing saving for the University, freeing up funds for the primary function of a college: academics. SDSU shouldn’t be spending hundreds of millions of dollars more on a stadium for an athletic program if it doesn’t have to. In terms of an SDSU expansion, both Measure E and Measure G fulfill that need. Measure G forces the city to sell the land to the university or some to-be-determined-later affiliate. Measure E has specifically given the university the power of eminent domain over whatever portion of the site they want, up to 35 acres, whenever the university actually needs to expand. That isn’t likely to happen any time soon, maybe not even within my lifetime. SDSU just approved the next 11,000 students on the campus it already owns and maintains and the state has capped enrollment growth at 125 kids per year over all three southern CSUs. That’s at least 80 years before SDSU starts to get crowded again. The biggest problem facing SDSU admission isn’t land size, it’s state funding. It’s why local enrollment has gone down and out of state has grown 14%. And that’s not changing any time soon. Is Measure G good for future students? This is an even bigger distinction between Measure G and Measure E. Measure G poses a massive risk for the current and incoming students. You don’t have to take my word for it, you can listen to the current President of SDSU, Adela de la Torre, who recently spoke to the San Diego Union-Tribune in regards to expanding into Mission Valley. That’s a double dip on students, with an increase in taxpayer funds coming to the university AND an increase in the cost to attend the school, all to fund the same stadium that SDSU could get for less than half the price under Measure E.
In addition, the university could be FORCED to increase student fees in order to pay for that same stadium. The consultant hired by SDSU to put together their Mission Valley plan, JMI Realty, said a few weeks ago in the Voice of San Diego, “If I’m right, the likelihood that student fees... comes into play is pretty low.” That comment was likely meant to be reassuring, but instead it raised alarm bells in my head. I had heard time and again that student fees wouldn’t be used at all under Measure G. But now the SDSU consultant himself is admitting that increasing student fees is a very real possibility! This wouldn’t be too concerning if the University had an actual funding plan. But they don’t. J.D. Wicker, the SDSU Athletic Director, said in the same VoSD article that “the University is still doing it’s homework. ‘We just haven’t finished putting those numbers together.’” And that’s just in regard to the $250 million stadium, not the rest of the campus expansion! The fact that this whole project has been in the works for almost 2 years now and the University still doesn’t have a funding plan for very first part of the Measure G AND can’t actually guarantee students won’t be directly paying for the stadium. That’s embarrassing and terrifying. Students don't pass classes if they don’t do their homework so why should administration get a pass on a project of this magnitude without having done theirs?? Why is Measure G worse for us, the local taxpaying Alumni? The tax burden is the most wide-reaching negative of Measure G. It embarrasses the university with how poorly thought out the entire “Friends of SDSU’ proposal is. Additionally, its impact on the taxpayers, including the SDSU alumni who managed to stay in this amazing city, is overwhelmingly negative. To begin with, Measure G doesn’t guarantee that the city will even receive Full Market Value ($83 million) for the land itself. The City Attorney, in her analysis, had a single word response to whether Measure G would require Full Market Value: “No.” That’s millions of dollars right out the gate that would be lost for the city tax coffers. That’s money that could have been used for improved homeless services, road repair, San Diego Unified School District and so much more. Measure G puts the burden of building, paying for, and maintaining a River Park on the City of San Diego rather than private dollars. Measure G takes away hundreds of millions from the local San Diego Unified School District, the K-12 system that the vast majority of San Diegans will go through, because Measure G doesn’t pay full property tax. Not everyone in San Diego gets to be as lucky as we were in getting to go to State, but every child here can go through SDUSD. Robbing the local primary education system is immoral at best, and could be considered the true embodiment of evil. Measure E generates $853 million for K - 12, while still accommodating and partnering with SDSU in every conceivable way. It’s the only measure that takes care of all walks of life in San Diego, both SDSU and non-SDSU affiliated. That’s why Measure E is for Everyone and why I am urging all voters in the City of San Diego to vote Yes on Measure E and vote down the poorly thought out and risky Measure G.